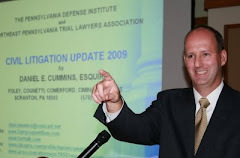 Tort Talkers may recall the blog post reporting on the granting of Summary Judgment in the Lackawanna County Court of Common Pleas decision of Rovinsky v. Lourdesmont, No. 2011-CV-2304 (C.P. Lacka. Co. June 19, 2013 O’Brien, S.J.) by senior visiting Judge Peter O’Brien in a slip and fall case that arose out of a cafeteria food fight. That decision was recently affirmed in a non-precedential Opinion by the Pennsylvania Superior Court. Notably the appellate court upheld the trial court's decision that the record confirmed that the Plaintiff assumed the risk of walking across a floor rendered dangerous by the food fight and that, given that assumption of the risk by the plaintiff, no duty was owed to her by the Defendant possessor of land. Anyone wishing to review the Superior Court's "Non-precedential" decision may contact me at dancummins@comcast.net. The prevailing defense attorney in this matter was Attorney Daniel D. Stofko of the Scranton office of the Cipriani & Werner law firm. 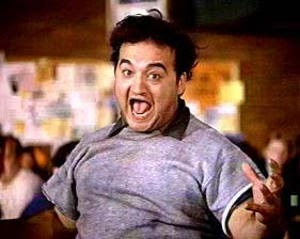 Source of photo: John Belushi from Animal House (1978).